It is enough Onsenkyo to the southeast of the Hakone encyclopedia mountain, and the foot of a saddle stool.The Ryokan and the hotel are built and located in a line [ a hillside ] from the both banks of the Chitose river which accomplishes a border between prefectures.a back Ryokan town has much still old wooden Ryokan -- a hot spring -- emotional rows of houses are left behind.It is the oldest historied hot spring in Kanto sung to the Ten Thousand Leaves.The hot spring called "the hot spring of a Yakushi-female budda" from ancient times often got warm, and circulation was urged to it, and it was referred to as effective against neuralgia, and was known also as "a hot spring of a crack", was used for a wound, a burn, a skin disease, especially a postoperative medical treatment, and has prospered as a recreation spa resort. Old rows of houses to which many wooden Ryokans were also left behind. 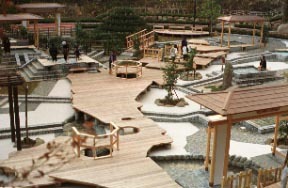 The inside of 10,000 leaf parks, "a unique hot spring." The hot spring institution of the footbath way of staying healthy, the adult of 300 yen. 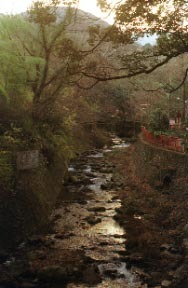 It is a flow Fujiki river about 10,000 leaf parks. Tomei Numazu IC -> Nekkan Road -> a National Route 135 yugawara senior high school crossing is turned left and gone straight on (about 12 minutes after about 5 hours and the yugawara senior high school crossing right-turn from Nagoya).